With the Honda Indy Toronto crossing forth into its 25th anniversary since the first event won by Bobby Rahal, my true relationship to the race started 12 years later. Able to physically attend my first “Molson Indy” event, I have always been welcomed with a spectacle of auto racing life and culture I could never resist the following year. A major tourist draw for 25 years based on celebration of the many allures for motorsport, I just happened to be one of those automotive enthusiasts attracted by the power of advance open wheel racing technology watching the pursuit of driver and team questing for the top mastery of speed. Granted media access to this year's very special Honda Indy event, the opportunity to present the racing festival of Toronto is now a responsibility wrapping many pleasures. Taking the only sensible method of travel through downtown Toronto (at least most of the time) is the TTC. Every time I ride on a subway car or streetcar, I suddenly hear the song “Romantic Traffic” by the Canadian 1980s new wave rock band “The Spoons” in my head. A little bit before of this websites readers (in fact “Romantic Traffic” roughly before my own interest in any music); the music video was staged within the subway line of the TTC during the mid 1980s. As I stepped off the TTC streetcar when reaching early morning rush of the Castrol Canadian Touring Cars, I was to know this year (perhaps for than any other year) the 2011 Honda Indy Toronto would provide this automotive writer and editor with inspiration so ripe with excitement. Arriving in the early morning hours, my residual sense of grogginess was vanquished immediately with action-filled day. Taking my first step into the media center acquaint myself with the part of my work area, an announcement that past event IZOD INDYCAR winner Marco Andretti will be in the media conference room was relayed. Arriving in a surprisingly near empty pressroom just past 9 am, the Iowa Speedway winner walked in minutes later. Having the 2011 race winner and third generation Andretti racer in the room, I regretted I was unable to think of an intelligent question ideal for the 24-year old driver. Through the day, I continued to consider what question I could have asked Marco Andretti. It was not until lunch that I had finally brainstormed a suitable query. Not a very serious question, I probably could have asked it there is any place in Toronto Marco enjoyed when the IZOD INDYCAR Series visits the city. I know, it's not incredibly hard-hitting and somewhat light-hearted but it would have been a break from the racing-related questions (not that the Honda Indy would be considered a tiring subject. As Marco Andretti left the conference room to prepare for Friday morning practice, I proceeded outside within the 1.755-mile track for the first time. 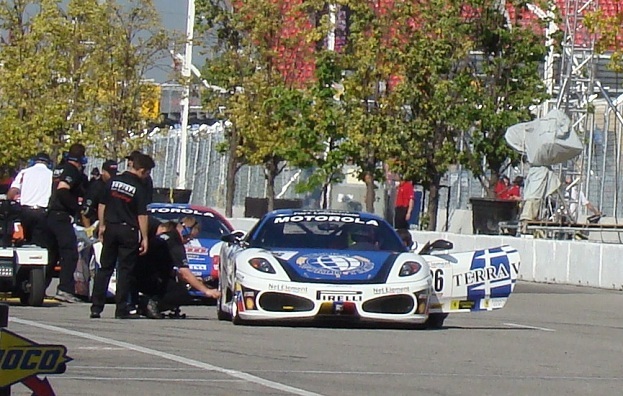 Under the beautiful, cloudless skies, the Ferrari Challenge cars warmed up on the 11-turn street course for the very first time. The sound as well as the movement of those almost completely stock Ferrari F430 and Ferrari 458 supercars demonstrated a near perfect accompaniment to high speeds of the Lakeshore Boulevard stretch. Taking in the show on the Thunder Alley grandstands, I recalled my first Honda Indy presence in 1998. There for the Saturday and Sunday, I remembered how exciting it was to watch the CART World Series in probably one of their last great seasons. With my own eyes that weekend almost 13 years ago, I watched Michael Andretti, Paul Tracy, Patrick Carpentier as well as the late, great Greg Moore roaring down the Lakeshore. 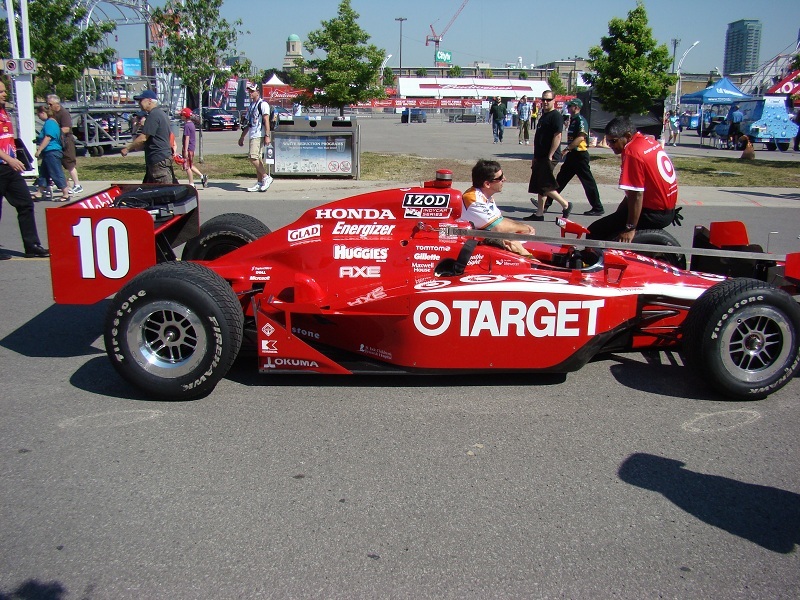 I remembered how the race was won by than Target/ Chip Ganassi driver Alex Zanardi. Recalling my first race, I began to wonder how many fans young and old would take in this 2011 Honda Indy event. Since the race lost the long-time Molson sponsorship, crowds appeared to have dipped considerably. 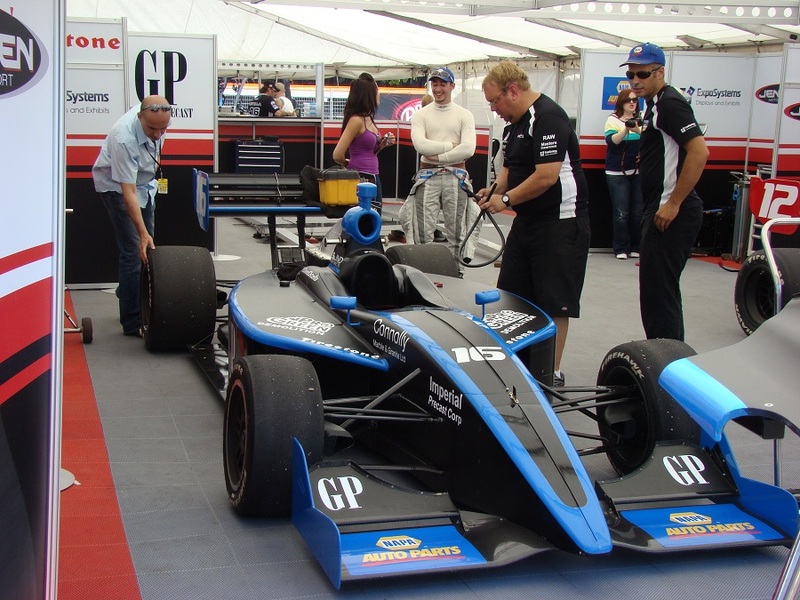 Following 2008 when a race did not take place due to reunification of open wheel racing, the 2009 Honda Indy had trouble bringing fans back to the event and not greeted kindly by the media. For 2011, this event is burning on all cylinders. To start, the Honda Canada sponsored Free Friday reached full potential as the combination of a sunny hot day and parent seeking to entertain their recently summer break bound tykes stormed through the attendance gates. By noontime, the CNE ground was well covered by a potpourri of individuals sharing the event. Besides the racing action on track, there was no shortage fun inside the enclosed Toronto street circuit including the IZOD INDYCAR Fan Zone. 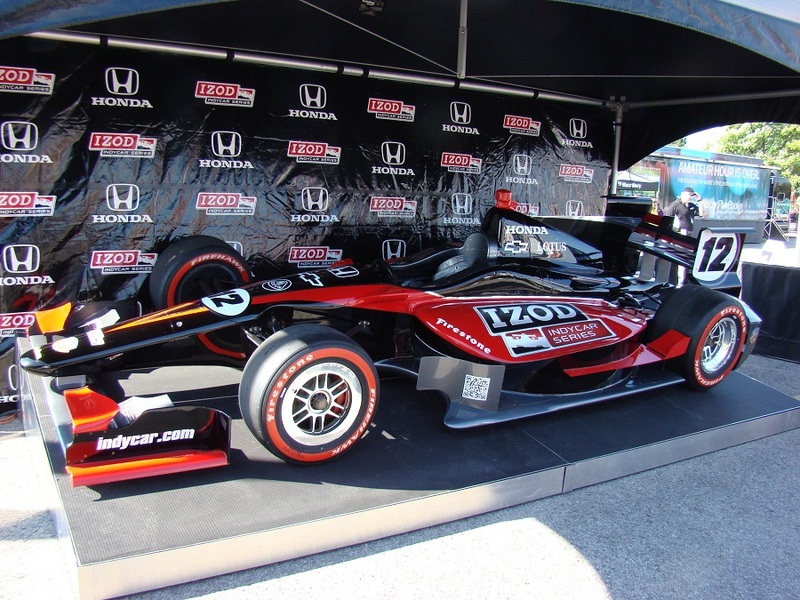 One of the sights on the area was a preview of the 2012 IZOD INDYCAR Series race vehicle. As the Ferrari Challenge cars left the track with only the memory of their brute, Italian sound, the Firestone Indy Lights cars prepared for competition. With the graduation of last year's Canadian Firestone Indy Lights series star James Hinchcliffe to the Newman/Haas Racing IZOD INDYCAR team, Canada's lone representative in the ladder series was Maple, Ontario's David Ostella. Riding 7th in the Firestone Indy Lights standing leading into the Honda Indy event, Ostella's rookie appearance with Jensen Motorsport did not go without notice by Canadian auto racing fans. During the weekend, that 19 year old was probably given a full initiation into what it means to be a rising auto racing star competing in his home country. With Ostella 6th fastest on track, Andretti Autosport's Stefan Wilson took fastest time in the morning practice on the streets of Toronto. As we know in hindsight, this top time for Wilson was a precursor to what would be a first career Firestone Indy Lights victory during Sunday's 100-mile event. In part 2 of my 2011 Honda Indy Toronto review, I will recap the arrival of the headline IZOD INDYCAR Series to the race track. Star drivers such as Dario Franchitti, James Hinchcliffe, Paul Tracy and Danica Patrick take to 1.755-mile race circuit. Below, I have compiled a few videos which are now posted on Youtube. Posting them much sooner than I was able to construct the written review of my 2011 Honda Indy experience, I am very impressed by the reception of both videos.